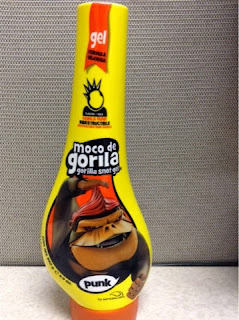 I want to do a product review for Gorilla Snot/Moco de Gorila® Punk Squizz . I purchased this product with my own money and this is my honest opinion. Discover a whole new world in hair styling, Gorilla Snot Hair Styling Gel (moco de gorila). This is THE product for all the most way-out hair styles that need GORILLA STRENGHT! Keeps hair free of residue, protects it and keeps it clean. This is the ultimate gel to make your hair spiked up. Packaged in our new easy squizz® bottle, this gel delivers maximum hold that will make your style last for hours until your next shampoo. The best part is that it leaves no residues. I came across this product on a Facebook group and saw that this was getting a lot of attention. So I thought I try it out. I only used this specifically to lay my baby hairs down. When my style was complete, I sprayed water on my baby hairs and added a bit of Gorilla Snot to style them. I used my fingers to shape them in a style. The first AND ONLY TIME I used this, it was tough to even get the gel. I mean, like too slimy to grasp. And once I finally got the product from the bottle, the snot was still "running down from my finger!" I had so much product on my vanity and clothes - and I only took a little bit from the bottle too! So once I finally put the product on my baby hairs (misting water first), it did lay them down for the entire day. I mean, they actually stayed...to the point that my temples were completely stuck as well! My baby hairs were so dry!!! I literally drenched them in water to revive them. I'm not planning on using this stuff ever again...and I don't even know if I want to give it to anyone. Yes it's only $3 dollars for about a 12oz of product...but it's so not worth it. I should have known by the ingredients...ALCOHOL is the 3rd ingredient! No covering it up or nothing. Straight up ALCOHOL!! So yes, it does what it claims and is definitely strong like a gorilla. BUT!!! If you love your baby hairs and you like having a really nice hairline, I wouldn't recommend this product. 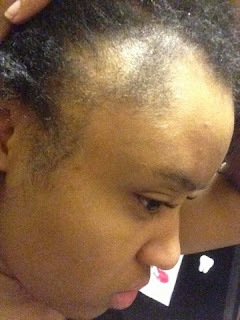 If your hairline is just growing back from TLC or you absolutely don't have one...RUN AWAY QUICKLY!!! I DO NOT RECOMMEND THIS PRODUCT NOR WOULD I USE/PURCHASE THIS EVER AGAIN!! I already had thin baby hairs, but DANG!!! Have you tried Gorilla Snot ? What did you think about it? 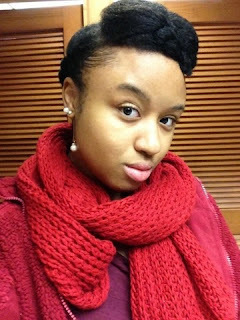 Natural hair says: make sure you read the ingredients and know exactly what you are getting for your hair care regimen. Even if you are trying a new product, use a little bit on a small section of hair and determine by your hair's reaction if that's the best product for you. *Gorilla Snot/Moco de Gorila® Punk Squizz was purchased with my own money and the review is my honest opinion. Just saying Loni!!! My edges really took a fall. I was so angry with the results. And the reviews even said that it wasn't good for the hairline...even if it lays it down. Yep, mine laid down and fell off :( I'll continue with castor oil. Thanks! Hair Tests | Vol. 1.5 What Is My Hair Porosity? Hair Tests | Vol. 1.4 What Is My Hair Density?